CHRISTIE LAGALLY writes a blog called “Sniffing Out Home: A Search for Animal Welfare Solutions” at www.sniffingouthome.org and is host of Living Humane on KKNW 1150 AM (livinghumane.com). I don't understand Tracy Fenn's allegations, as video on YouTube and on the Elephant Sanctuary Web page show the keepers caring for the elephants' feet using positive incentives. The video also shows keepers taking ATVs into the hundreds of acres of the park in order to bring food to the elephants, wherever they happen to be. Tracy, are you alleging that these videos were staged and are, in fact, false? If so, how did the elephants happen to cooperate with the keeper caring for their feet? 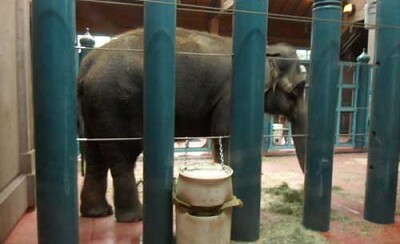 Second, why is it not an option at Woodland Park Zoo to expand the paltry acre of space given to the elephants? Could some of the African Savannah space be allocated to them? Even 2 acres would be kinder than one. Tracy Fenn's information is entirely made-up and untrue. You can visit the sanctuary's website, FAQ page for information on that. http://www.elephants.com/faq.php This comment has been hidden due to low approval. The elephants need to get out of the zoo. The conditions they are kept in do not meet the needs of the elephants. The zoo admits that the breeding program is failing and that zoo elephants will cease to exist due to the inability to breed more. Bruce Bohmke from the WPZ said that they would "rescue" elephants from Asia or Africa if they ran out of elephants bred here. Please stop the elephant program and send them to a sanctuary, where they can have a better life than what they have here. And don't get any more! This comment has been hidden due to low approval. The elephants at the sanctuary in Tennessee suffer medically because of the "hands-off" approach to their care. Captive elephants need significant training to cooperate for foot care and other medical procedures that keep them healthy. The elephants there also do not "roam" because they are fed at one location by inexperienced caretakers who don't seem to understand that they won't roam if they don't have to for food resources, etc. This lack of roaming leads to increased health issues, including foot conditions. Please investigate the facilities you are condoning before bashing anyone. This comment has been hidden due to low approval. Christie Lagally makes excellent points in her piece "WPZ Task Force Considers Sanctuaries." It's hard to believe that the task force would consider any other option than sending Chai, Bamboo and Watoto to a true sanctuary after reading this reasoned argument and The Seattle Times December expose's on the same subject. This comment has been hidden due to low approval.